Preheat the oven to 350 degrees. 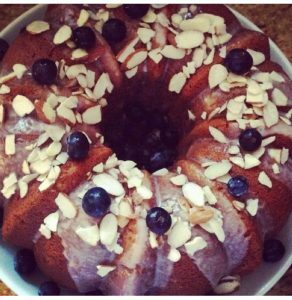 Set out a 10-12-cup nonstick Bundt cake pan. Add the eggs, one at a time, beating well after each addition, stopping to scrape down the side of the bowl once or twice to make sure the ingredients are combining evenly. In a separate bowl (all dry ingredients), whisk together the flour, baking powder, and baking soda. Add 1/3 of the flour mixture to the butter mixture, mixing on low speed just until the flour disappears. Add 1/2 of the buttermilk, beating on low to incorporate, then the second 1/3 of the flour mixture, the remaining buttermilk, then the last 1/3 of the flour mixture, beating just until the flour disappears and the ingredients are blended. The batter will look a little shagging by should not have any large lumps. On low speed or by hand, mix in the lemon zest (I usually just zest right over the bowl). Generously grease the bundt pan with nonstick spray. Pour the 1/2 the batter into the prepared pan, then sprinkle with 1/2 cup of the blueberries. Add the next 1/2 of the batter and sprinkle with the next 1/2 of the blueberries. Continue alternating the cake and berries, ending with the batter. Gently shake the bundt pan so there is no bubbles and the top is level off. Remove the cake from the oven. Immediately run a thin knife carefully between cake and pan all around the edge to loosen it. 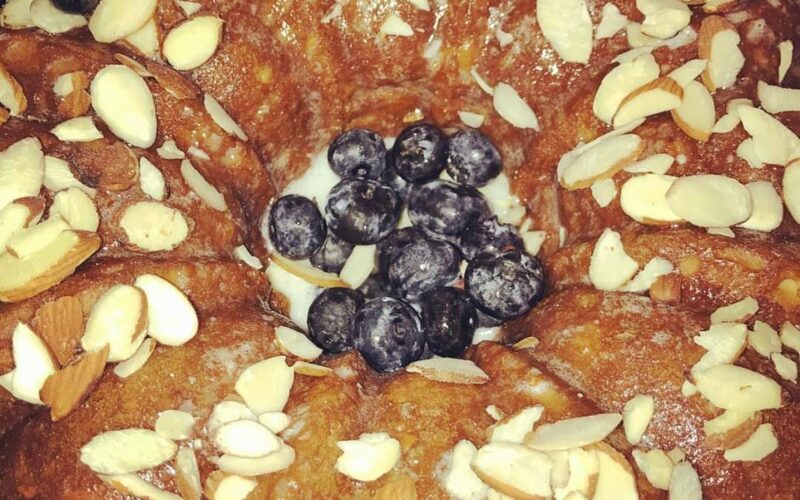 Place the bundt pan on a cooling rake. Let cool completely on the rack. Once the cake is cool…turn upside down onto a plate or cake stand. While the cake cools, prepare the glaze: In a small bowl, whisk together the powdered sugar, lemon juice, and milk until smooth. If you desire a thicker glaze, add a bit more powdered sugar until your desired consistency is reached. 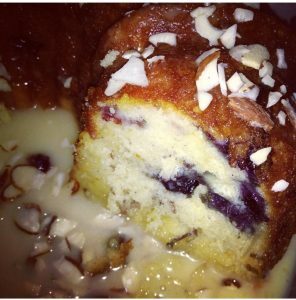 Drizzle over the cooled cake and garnish with some fresh blueberry.